The primary aim of exobiology research is to recognize the routes leading to the initiation of life on Earth and its plausibility elsewhere in the universe. How would we recognize life if we encounter it or its remnants on an extraterrestrial body? This is the critical question of biosignature research to which astrochemical studies can contribute. Our understanding of preserved fossils and contemporary terrestrial life serves as a guide in the search for biosignatures in the universe. 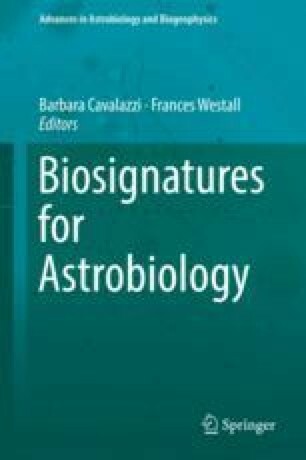 Of the various life-detection techniques available, carbon chemistry is particularly pertinent and perhaps the most significant biosignature (Summons et al., Astrobiology 11(2):157–181; 2011). ‘Life’ as we know it is based on C, H, N, O, P, S chemistry and the organic matter derived from its remains is ubiquitous on Earth, constituting an extensive chemical and isotopic record of past life that surpasses by a huge margin what is recorded by visible (and microscopic) fossils. Biosignatures are highly subjective to the geological conditions in which they form and the subsequent diagenetic and metamorphic events that reprocess them (Sleep, Cold Spring Harb Perspect Biol. 2(6): a002527; 2010) and thus need careful assessing before coming to concrete conclusions concerning biogenicity. However, chemistry alone is inadequate to detect life and collaborative efforts from all of the relevant investigations, combined with considerations of geological and environmental factors, will likely provide the best evidence for the presence or absence of life, in localities of interest.